Extracted juice captures about 95% of the nutrients from fresh fruits and vegetables. Drinking extracted juice is the fastest and most efficient way for your body to digest and absorb all of those nutrients. Digesting whole fruits can take about an hour; extracted juices take only 15 minutes. 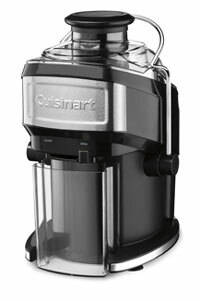 Now you can create these tasty, nutritious juices, smoothies and more right at home with the Cuisinart Compact Juice Extractor. The pulp container, juice pitcher, cover and filter basket/blade assembly are all removable and dishwasher-safe, making cleanup easy. A cleaning brush is also included to remove excess pulp from the filter basket/blade assembly and the lid. With its compact size, it will suit any kitchen. 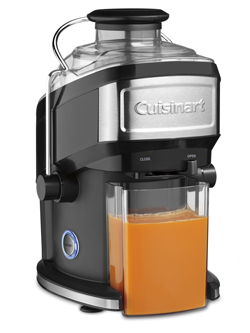 Create your own juice bar at home with the Cuisinart Compact Juice Extractor. 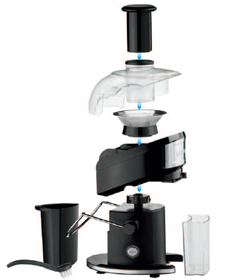 One-Touch Operation An on/off push button with blue LED makes the juicer easy to use. Mesh Filter Basket & Blade Assembly Easily separates pulp and grinds to extract the maximum amount of juice. Food Pusher Fits securely into the feed tube to guide fruits and vegetables properly while juicing. Cover with Large Feed Tube Minimizes the time spent pre-cutting ingredients. Safety Bar Must be up and locked over the cover for the juicer to operate. Adjustable Flow Spout Controlled manually and prevents dripping. Juice Pitcher Holds up to 16 ounces of juice and can be replaced for uninterrupted juicing. Great Compact Juicer I purchased this juicer yesterday and have already enjoyed two glasses of great tasting fresh juice. I was looking for a small juicer that can stay on my counter top and not take up too much space, this does the trick. It is significantly smaller than the Breville Compact. The only other juicers that have this small of a footprint cost three to four times as much.It is also very easy to clean by hand. I don’t have a dishwasher, so that was important. It helps to add a little water when juicing greens like parsley or kale.The juice produced is pulp-free and delicious. Highly recommended. well made I have now had this juicer for a couple of weeks and I have to say I have been enjoying the benefits of creating a variety of juices. Additionally, this machine is very easy to clean. It takes me approximately half an hour total to make my juice and clean all the parts in the sink. My only critique is that if you are going to make enough juice for two it is better to use a measuring cup that fits underneath the spout as there is often a great deal of foam that fills the top portion of the 16oz container provided with the machine.